The apartments overlooking the corner of 7th and C Street – and Eastern Market – will be occupied starting in September. The newly opened C Street between the North and South Buildings of the Hine project will open to the weekend flea markets the weekend of September 31. Last January, tenants moved into the 34 affordable units in the North Building (managed by Buwa Binites’ Dantes Partners). The project’s remaining residences – overlooking 8th Street – are still under construction and will not be finished before October. The below grade Trader Joe’s will front on Pennsylvania Avenue, near the center of the project’s south facade. No date has been announced, but Trader Joe’s is likely to open in the late fall. 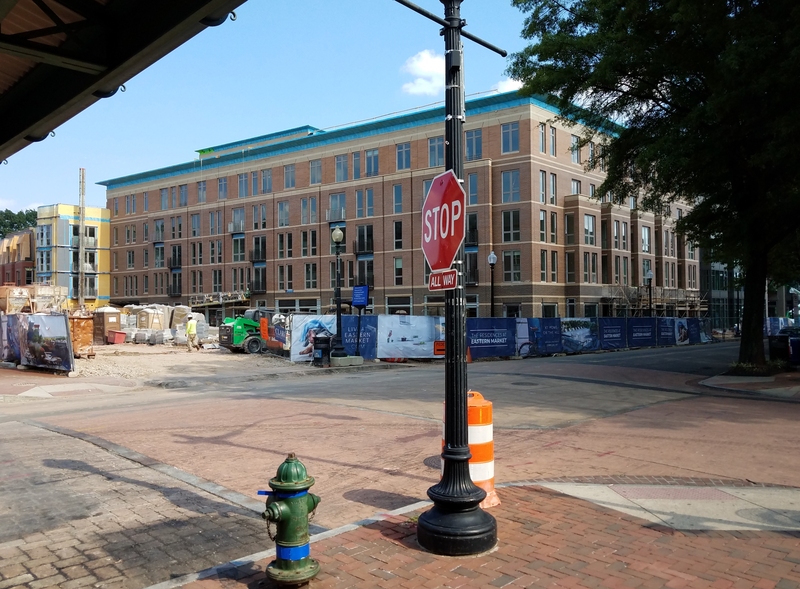 No information has been released regarding tenants for the ten ground floor retail spaces along 7th Street and on the 7th and Pennsylvania Avenue corner of the project. The Eastbanc representative says that negotiations are underway with an operator for the day care center on the 8th and D Streets corner of the building. The amenity is being mentioned in the marketing of the residences, raising the question of whether tenants will be given preference. 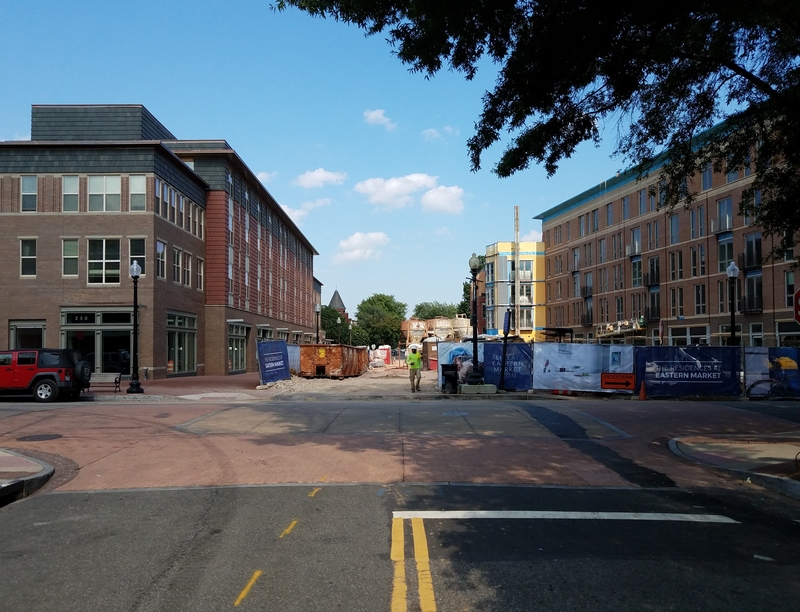 The newly reopened C Street between the North and South Buildings will be available to the weekend market vendors for set up on Saturday, September 30, and Sunday, October 1. C Street will be open for traffic and metered parking starting on Monday, October 2. Flea market managers have signed three-year contracts to operate on C Street and the Plaza. Regarding whether or not 7th Street between C Street and Pennsylvania Avenue remains closed once the flea market vendors relocate will be the subject of discussion at two prospective community meetings – one hosted by ANC6B and the other by Eastern Market Community Advisory Committee (EMCAC). Dates of the meetings have not yet been set but are likely to occur at the end of August. Work on the below grade 320 parking space garage is proceeding, and once completed the occupancy permit will allow use of the garage by project workers which will relieve pressure on neighborhood parking. Under an agreement with the community, any residential tenants of the building will not be eligible for Residential Parking Permits on nearby streets. The office space portion of the project, overlooking 7th Street, will not be available before November 1. So far, one tenant – a company offering shared office space – has been announced. ANC6B negotiated office space for itself within the project during the PUD process as one item in the community benefits package in exchange for zoning changes permitting greater height and density. The ANC is likely to vote on a proposed lease for the space at its September 12 meeting. Doesn’t anyone else see an inherent conflict of interest in the ANC “negotiating office space for itself” from a private entity about which it is supposed advise the city on regulating? There’s no more conflict than any other government entity that leases space from a private entity. I disagree, this is a corrupt transaction using govermment power to demand amenities for their own use. Also, didnt they already pull this scam with the Navy Hospital redevelopment? Anyone know how much the apartments will be renting for?